No footpath? No lights on the road? Tom Shehan wants pedestrians and cyclists to wear high-vis. A Fine Gael Senator and former TD from Co Kerry wants to force cyclists and pedestrians to wear high-vis on rural roads. 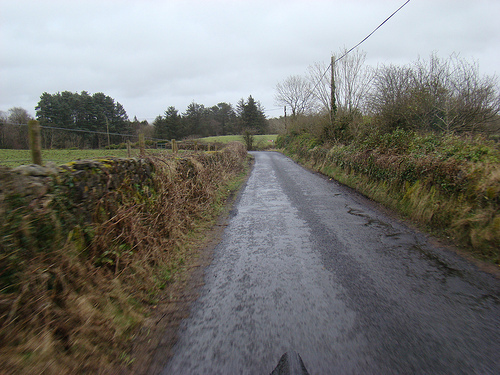 Tom Shehan — who seems to have recurring “run-ins” with people walking on rural roads and claims that drivers are seen to be “always to blame” — raised the issue on February 4. Shehan highlighted how three cyclists have been killed already this year. However, online records of Oireachtas debates shows that this is the first time he has mentioned cyclists as a Senator and he never once mentioned them in the Dail as his time as a TD. According to records, he has also never mentioned cycling or bicycle in Oireachtas debates. “I believe it should be compulsory for people walking and for cyclists in areas where there are no footpaths or lighting to wear reflective jackets,” he added. “There is a feeling among the community that anybody who is unfortunate enough to knock somebody down on the roads is nearly always to blame — either the driver was speeding, the driver had drink taken or the driver had done this or that. Given the number of people who are walking our roads in pure blackness, wearing dark clothes, it should be a criminal offence not to wear a high visibility vest when walking the roads at night,” he said. Sounds like the Senator should not be driving on unlit roads around Christmas time. Indeed. If you are driving fast enough to not see an unlit pedestrian or cyclist, you are driving to fast for the road conditions full stop. What about if a tree, overturned vehicle, or loose horse/cow was on the road? That’d do a lot more damage to your front bonnet than a child walking home…. Maybe the good Senator might consider Hi-Vis jackets for farm animals while he`s at it! How about making it illegal to driver faster than 20kph at night – that would be safer for pedestrians, cyclists and drivers themselves. And so the fatwah against cyclists continues! Yet another “public representative” decides to alienate members of “the public”. Then again being a Senator is hardly being a REAL Public Representative, is it? Putting aside the Senator’s jaundiced views of “Other” road users, i.e. anyone not in a motor vehicle, I take it that he was “on Dáil Business” when he was not “driving with due care and attention” and fortunately managed not to kill yet three more vulnerable road users. Perhaps the good Senator could use his good offices to encourage a little Law enforcement when it comes to reckless behavior on our roads? Driving without being able to stop in the distance you can see to be clear is unsafe and unlawful driving.